It's in print! The Wildlife Friends of Thailand and I have finally printed our comic book with the help of the International Primate Protection League (IPPL).. The first run was a fairly small number of books in English with more books in Thai coming next week. 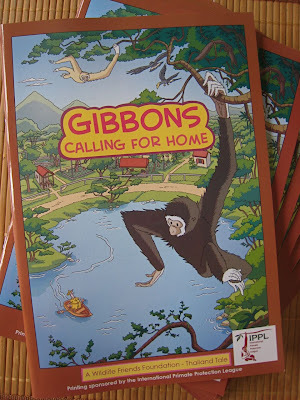 Most of the Thai-language books will be distributed to local schools for free so that kids can learn about the lives of gibbons that are stolen from the wild and kept as pets. My English-speaking friends will have to fight over the English-language books that remain after the IPPL receive theirs. At the moment we don't have plans to distribute the books online or in the book stores, but I'll keep you posted if that changes. I'd like to at least get a downloadable version of it up at some point. Finally! My first comic book. Sadly Sil and I won't be coming to Petchaburi with you guys this weekend, we where really looking forward to seeing the Animal rescue center and sleeping in tents. But Sil is still a bit dizzy from the Attack of the Mosquito, so we are taking it easy in the city of Bangkok or going on a relaxed trip to Hua Hin tomorrow. See you at drawing classes next week. Thomas, sorry to hear you can't come. I'm glad you're going to take it easy with Sil. I hope she gets better soon! We'll have to plan another trip to the jungle; maybe Khao Yai next time. Oh, and I forgot to give you a copy of the book last Tuesday... I'll bring one next week! It's been a long time coming but you did it!!! You should be very proud! Please save me one Mark. Hi Yee!